Polytechnic College held The second tutor professional skills contest in Room B104 in Administration Building on new campas on May 28th. Liao Xiaohua, the party committee membe; An Lifeng , director of Student affairs; Wang Xiaofeng, Secretary of Youth League Committee;Zhang Wenlin, deputy director of Student affairs and administraters of college and student work department faculty attened the conteat. Aiming at consolidating the tutor work foundation, promoting tutor professional ability and their professional quality and then eventually strengthen and improve college students' ideological and political education and promote their comprehensive development, the contest was divided into five parts: basic knowledge, class knowledge, themed class meeting, Case scenarios and themed speech. All the tutors of the college attended the contest and they fully demonstrated the spirit and good professional quality. Li Xiaohua made a speech after the contest. She said that with the development of the times, Students present informative, strong personality characteristics and demand more as well, which has brought challenges to tutors, has also request specialization of professional tutors team construction. She offered congratulations to the tutors, and thankfulness to the teachers who has devoted themselves to students. She hoped teachers and students can encourage each other and develop together. After a day of fierce competition, Yang Jingfei, from Engineering Department II, Liu Zhiyao, from Department of Economics and Management, Cheng Cheng, from Department of Arts and Science, got the first prize in class knowledge section; Quan Kun, from Engineering Department III, Liu Qiang, from Department of Economics and Management, got the first prize in themed class meeting section; Shang Chengyuan, from Department of Humanities and Law, got the first prize in themed speech section. 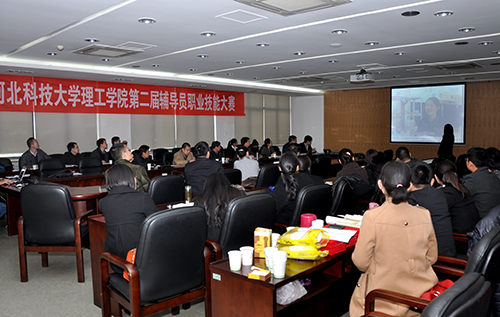 Zhang Lizhong, Secretary of Party Committee, Cao Hongfei, deputy Secretary of Party Committee, spoke highly of the contest, hoping teachers can promote themselves via the contest and improve the ability of management and service level. 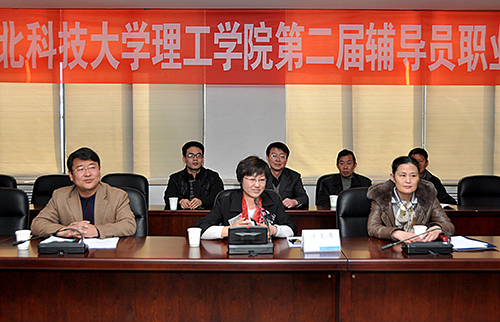 Liu Chaoying , the Dean of the Polytechnic College, and Zhang Lizhong, Secretary of Party Committee, handed over the certificates to the winner teachers.